I don't compliment myself much or think too highly of myself but I do have nice nails. They are strong, long and grow quickly - no bitten nails around here. I think having nice nails is really important and it's one of the first things I notice about people. We have all seen those 'if a person with nails like this touches me...' memes (see here) and if I thought I was fussy about nails then then boy, I am even worse now! I have never been a nail biter or picker although my nails do have a tendancy to split halfway down which can be so, so painful! I think this happens because my nails get so long that a bit of a knock can really damage them. This happened recently to both thumb nails so I had to file all of my nails down which was a real blow to the gut I tells ya. There is nothing I dislike more than short nails, probably because I spend a lot of time staring at them everyday, so I decided to try false nails for the first time ever. I have always loved the whole pointy, stiletto nails so I decided to try the Elegant Touch Totally Bare Stiletto False Nails. "Totally Bare nails are a blank canvas so you can create your own look. Whether you want to polish them or get inspired with nail art, they are simple to use as you can decorate the nails before applying them to your hands. Polish lasts much longer when applied to a press-on nail as it adheres firmly and the lack of moisture, found on your natural nails will ensure the colour will not lift. Glue is included for application and will give fantastic results for up to 10 days when applied according to the instructions." I have never used false nails before so I wasn't too sure what to expect from the box but included within the Elegant Touch Totally Bare Stiletto pack is 48 nails in 10 different sizes. The instructions say it takes just 10 minutes to apply a set of nails and all I can say to that is HA HA, have you met me? An hour and a half I was still sat there fiddling around with strange shaped pieces of plastic. I made sure my nails were clean and free of any nail polish then I tipped the entire packet of false nails onto a table and tried my hardest to size them up against my real nails. I actually found this really hard as the nails weren't numbered in any way and I started to find it tricky in trying to find two of the same size as, towards the end, none of them seemed to fit! It took me forever. In fact, it was the hardest bit. Once I had finally found the correct sizes and managed to work out how the glue included came out of it's bottle, it was a breeze. 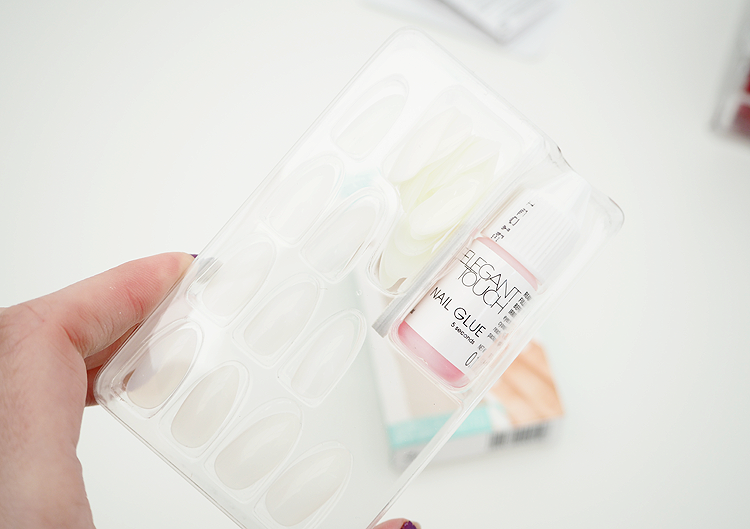 All you have to do is spread a small dot of glue onto your nails, being careful you don't get it on your skin, clothes or in your eyes, then carefully place the nail just above your cuticle. Once it's on, you just need to press the nail down for a few seconds just so it's secure and that's it. Pretty hassle free and easy. I can see why they say it would take 10 minutes as it really is very straight-forward. I really loved the look of these false nails bare but as I was going to a wedding I decided to paint them to match my outfit. I found that the nail varnish dried a lot faster on these Elegant Touch false nails, as opposed to my real nails. I also didn't manage to smudge them like usual either which is pretty remarkable. Elegant Touch claim that nail polish lasts a lot longer on false nails as opposed to real nails and I totally agree. The nail polish has not chipped at all when it usually starts to wear away after a day or so, although I have only been wearing them for 4 days. Those are all of the pros, let's talk about the cons! Within less than 24 hours, one nail fell off. Typically it was mid-wedding and I didn't bring any glue with me to stick it back on with which is a real pain. Since then three other nails have fallen off and I have had to stick them back on again and I have to say, I wasn't doing anything too strenuous when this happened. For example, opening a door, wrestling with a pair of tights, that kinda thing. I haven't minded too much as it hasn't happened when I have been at work but if I go to work tomorrow and accidentally give my customer their purchase and a little somethin' extra that they didn't ask for, I won't be too happy I tells ya. I do really love these false Elegant Touch Stiletto Nails as I just adore the shape of them - they make me feel like Adele. They are really easy to apply, once you have successfully managed to match the false nails up to your real nails in size, and I find it much easier to paint these false nails than my real ones as they dry so much quicker and don't chip as easily. The only downfall to these nails I find is that they are so temperamental. One nail fell off within less than 24 hours which I found a little disappointing considering they claim to last up to 10 days. I find that I am constantly looking down at my nails just to check that they are all still there! I think these nails are great for an occasion and for just a short wear but I couldn't trust them enough to wear them for long periods of time. If you wanted these false nails on for longer than a couple of days then I would just go and get them done professionally as the constant worry of them falling off at inappropriate times would just drive me mad. That said, I do really like them, although maybe I won't wear them to work, just in case! Great post, I love the shape of these nails. I agree with you that having nice nails is important as it just makes someone look like they took care of themselves a bit better. I think these false nails would be great for if you had somewhere to go to for the day/night but for long term they just tend not to last long. These look amazing! I love Elegant Touch nails but have never seen these ones in Boots! I use to work with someone who wore thee constantly and they never fell off! That is not me though haha. I love wearing falses on a night out, but I always carry the glue and a spare one with me, just in case lol. Looks really good, I think rather than getting mine professionally I will get some like these which are fairly easy to take off! I need to take mine off for work.